Thank you for taking the Whataburger Customer Survey. Please enter the survey code located towards the bottom of your receipt. 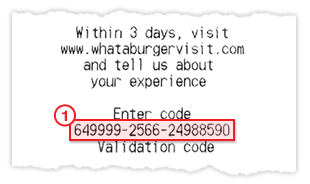 To see a picture of the survey code location, click here. If your receipt does not have a survey code, click here.